Keywords: Doege-potter syndrome, solitary fibrous tumor, hypoglycemia, IGF, fall, lower hemithorax measuring. Keywords:Doege-potter syndrome, solitary fibrous tumor, hypoglycemia, IGF, fall, lower hemithorax measuring. 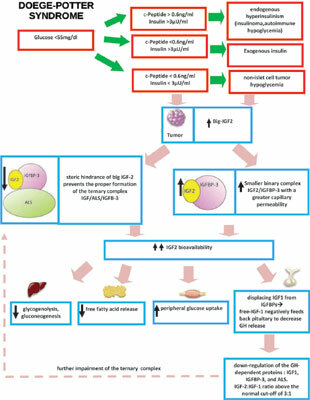 Abstract:Introduction: Doege-Potter Syndrome (DPS) is a rare but life-threatening paraneoplastic syndrome, characterized by Non-Islet Cell Tumor-Induced Hypoglycemia (NICTH) secondary to a Solitary Fibrous Tumor (SFT), which secretes an incompletely processed form of Insulin-like Growth Factor 2 (IGF-2).